What should I eat during my trip to Budapest? What are the must have foods and drinks in Hungary? Where can I eat the best Goulash? These are questions that I get asked often. So I’ve teamed up with Budataste who has created a booklet that gives you the opportunity to have a taste of Budapest, with the Budapest Food Passport! All your eating questions have been answered. You’re going to visit the top 10 places to see in Budapest on your trip, right? Along the way you can use the Budapest Food Passport and locate the very best selections in the area. 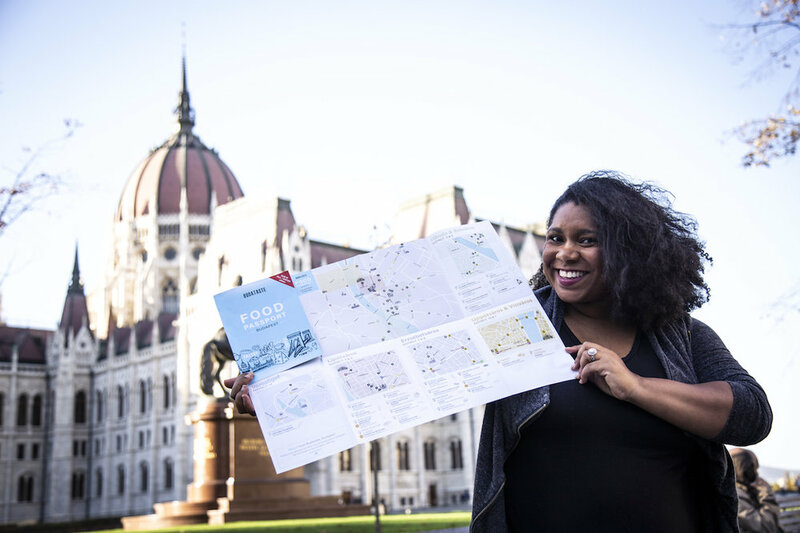 It doesn’t matter if you see the city in 1 day or 3 days, the Budapest Food Passport gives you various options of where to eat and drink near the top sightseeing locations. No, these are not tourist trap selections. They give you a locals perspective of how the locals enjoy Budapest, it just happens to be near all the sights. I loved discovering new places in the city that were mouthwatering, and I can’t wait to go back and try more of the selections at many of the places. You purchase the booklet through this link. You’ll select the pick up location upon purchase. Then you will receive a confirmation of where to pick up your Budapest Food Passport Booklet which includes a code. We decided to pick up the Budapest Food Passport in the City Center. They have teamed up with Urban Betyár which is one of the restaurants on the list. They distribute the booklet. You give them your confirmation code that is in your confirmation email, and boom you’re set! You get 6 vouchers that you can use at any of the 25 various selections in the booklet. There is a golden ticket that can only be used at specialty locations which are indicated on the map. Urban Betyár is one of them. So while you’re looking over the map you can use your golden ticket there and while you feast you can map out how you will use the rest of the vouchers during your sightseeing adventures. But you only get one golden ticket… so use it wisely! And yes this is a wise choice. But it’s up to you how you use it. At every location I visited they were able to offer me up an alternative for my dietary restrictions. Which was kind but I’m sure this is not always guaranteed. Now it’s just a taste of Budapest, so if you want something off the menu the restaurants or bars would love for you to stay and order more. Although some tastings were more filling than others, it gave us some insight on what the hungarians like to eat or drink and if we liked it too! There are various ways to use the Budapest Food Passport. The map includes a suggested route on how to use the passport and see the sights at the same time. Take a look below at their suggestion and what I call a great way to see Budapest. If you’ve already planned out how you want to explore the city before you arrived then you can easily map out how you are going to use the pass. This is what my husband and I did. We knew we wanted to go to the thermal spas at Gellert, then walk over and see the famous Central Market, followed by a stroll down the cool store fronts on Váci Street. So since we had a plan, we then opened up the map and figured out how we were going to get the best taste of Budapest. We started with using a voucher for a wine tasting near Gellert, strolled across the beautiful Liberty Bridge and wandered into the Central Market. We later strolled down Váci street and used our next voucher to get a shot of Hungarian Pálinka. Our stroll continued and lead us to Trabant '60 Retro Lounge & Bar where we used our golden ticket for Meat and beer. It was a perfect day. I'm a planner, so i'll buy now! Personally as a tourist I would book this combo. So if you love Hop-On-Hop-Off busses, the cool thing is that you can use this along side the Budapest Food Passport. Budataste sells this as a package deal. See the sights at your leisure with the Hop-On-Hop-Off Bus, check the map if you get hungry or thirsty, then see what’s in the area and go and taste. You’re going to love the freedom this map gives you. It takes the guesswork out of figuring out what you’re going to eat and drink when seeing the sights. Plus there’s a free river boat ride included. Best Value! Use up all your vouchers in one place, or in one day, or over several days. That’s the beauty, it’s entirely up to you how you use the Budapest Food Passport. Just don’t leave any vouchers behind, which is hard to do with so many great ways to use the vouchers. So what are you waiting for, get your Budapest Food Passport today. It helps take the guesswork out of where to eat and drink. They did the work for you and gave you all the options you want to try anyway. Goulash, Langosh, Chimney Cake, Pálinka and more! Plus its all along the sightseeing track of Budapest. Click the link to find out how my Husband and I used the Budapest Food Passport. Honestly, we had the best time using the vouchers over a course of two days! We even added some places to our list for future date nights! What do you look forward to eating or drinking in Budapest? Let me know in the comment section below!